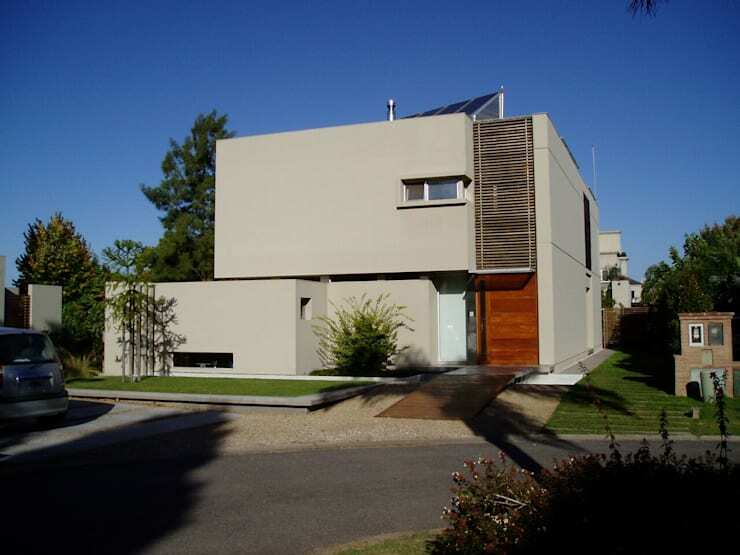 Today on homify 360°, we jet off to Buenos Aires for a sneak peek at a modern residence that offers a stylish lifestyle. Brought to us by architectural firm GATARQS, this house is divided into two wings: one devoted to socialising and leisure activities, and another for the typical day-to-day functions of the resident family. 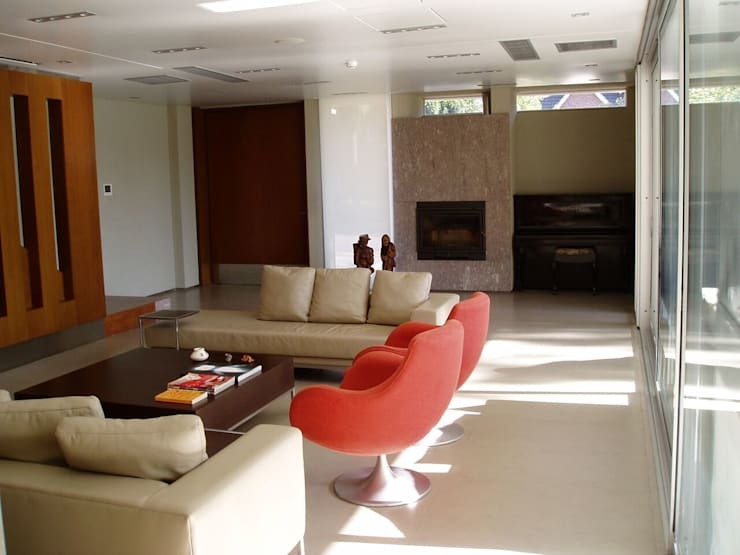 Because of these two areas with their own unique themes and actions, the house layout was designed in order to fit in with the family’s lifestyle requirements. 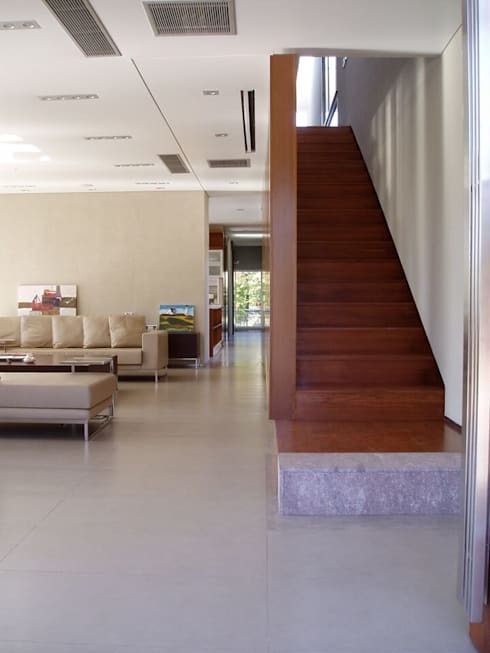 Although the different volumes are closed off from the outside, they are open and welcoming once inside the property. Modern, straightforward, functional, stylish… just a few words we can use to describe this discovery. Let’s move in for a closer look. The facade of the first volume presents a linear and modern design, decked out in stylish neutral colours. As noted, it is rather closed off from the street (no gigantic windows allowing us to glance at the insides). This two-storey space open up onto the spacious garden at the back, and consists of the living environments such as the living room, kitchen, bathrooms and bedrooms. Looking at the second part of the house, situated right next to the first volume, it’s easy to see the look and elements shared by both: horizontal lines, elongated windows, neutral colours, and some touches of wooden finishing for a striking effect. They both share a lawn marked off by straight and rigid lines that blend in beautifully with the linear design of both sides. 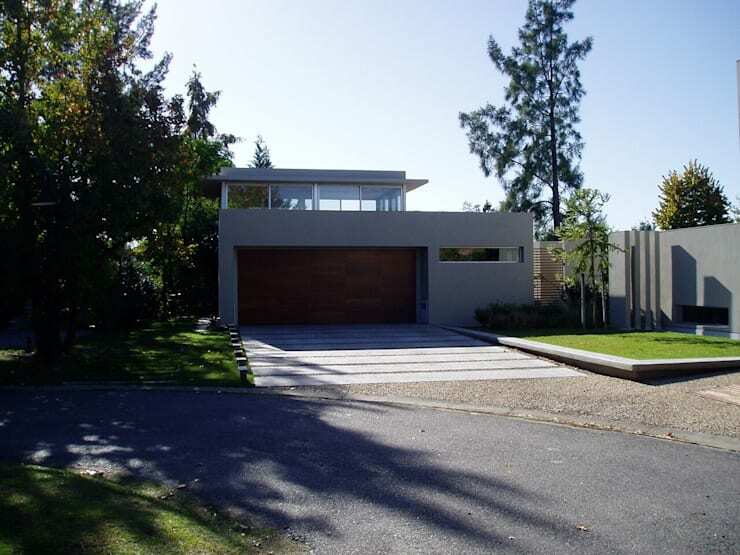 Apart from being the “leisure” section of the house, this volume also serves as the main garage. On to the interiors! We can immediately notice how bright and airy the inside spaces are. Large windows open up onto the garden (shared by the two structures) and allow for a healthy dose of natural lighting to stream inside. Mimicking the palette of the exteriors, the interior colours also tend towards an earthy neutral, but this time we have a few spots of warm tones in the decor added for a welcoming vision (most notably in the modern swivel chairs). The wooden staircase introduces a delicious caramel tone into the neutral colours of creams and beige. Following the staircase will take us to the private rooms upstairs, where the bedrooms and bathrooms are located. From this angle we can see how spacious the interiors are – this really is a welcoming and roomy house fit for the modern (and growing) family. Because we know they’re so much more than simply steps, we’re ready to assist when it comes to: Decorating Your Stairway To Heaven. It’s time to count the style stock outside – and what a garden! Behold the lush green grass that serve as a soft and natural view for the indoors. 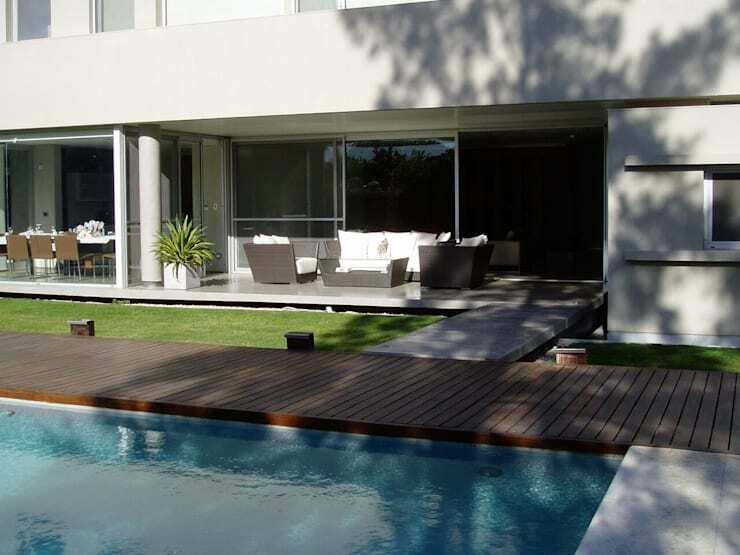 And we can’t miss those wooden deck and loungers, seemingly luring us closer to the poolside. 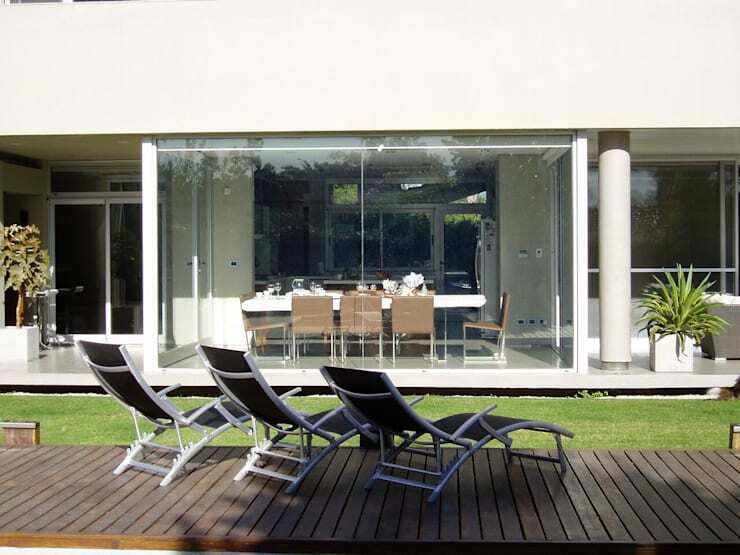 The dining room has been placed on the patio, but closed off with glass glazing, allowing for an exterior dining experience under the stars without having to worry about wind or rainfall. Get your creative juices flowing (and your green fingers itching) with our superb collections of gardens here on homify. A superb time outdoors is guaranteed. A striking wooden deck; a lusciously blue pool beckoning us for a dip; and some delightful patio furniture where we can enjoy the fresh air (and evening cocktails) in style. The furniture follows the same earthy neutral palette shared by the interior/exterior spaces, yet in a softer, more delicate hue to really get us in that relaxation mood. We just love how the patio is connected to the deck, making our strut to the pool very “runway” like. Before we bid adieu to this fabulous residence, we must take a better look at that pool (and garden). We can see that the deck is connected to the second housing volume, which is the garage building seen from outside. Flourishing vegetation grow on the side of the pool, making this garden a striking oasis of cool blues and lush greens, with the occasional pink spot added for vivacity. Definitely a fantastic way (and venue) to spend every day of the week! Love it or hate it? Tell us what you think of the house in the comments!